Another week, another Halloween weekly planner spread. 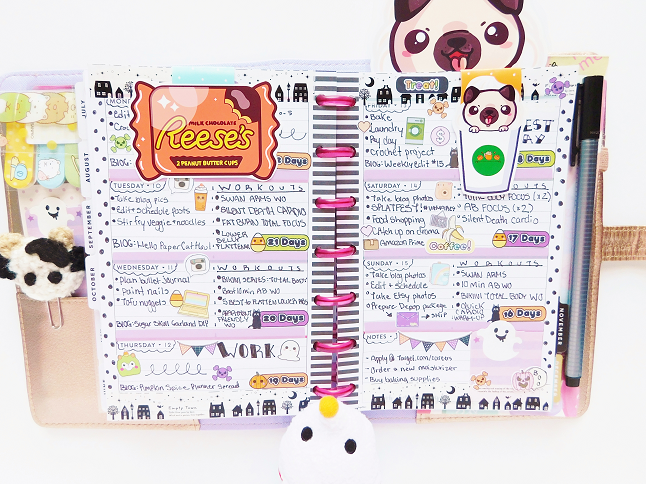 You can see last week's planner spread here. This week I decided to add some lavender to my spread because it's one of my favorite colors but of course, I had to include lots of spooky decorations! Here is an overview of this week's spread. 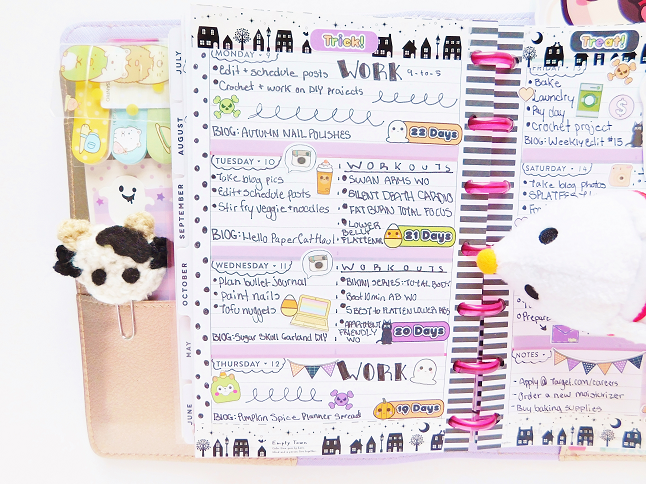 That crocheted cow planner paper clip on the left side was made by me! What do you think? I've always wanted to crochet some planner clips but since paper clips are small that means that I would have to crochet small with a thin crochet hook, which I'm not the best at. The smallest I can crochet with is a F/3.75 mm and I used a G/4.25 mm hook to make the cow which I thought was too bulky. Let me know if you guys would be interested in seeing more crochet paper clips. The washi tape I used this week has a poem written across the tape so I decided to call this spread Empty town. I was able to arrange the Halloween countdown stickers where I wanted, unlike last week. On days where I didn't have much going on I drew a spiral spring-like doodle because I don't like having too much blank space on such a wide area. 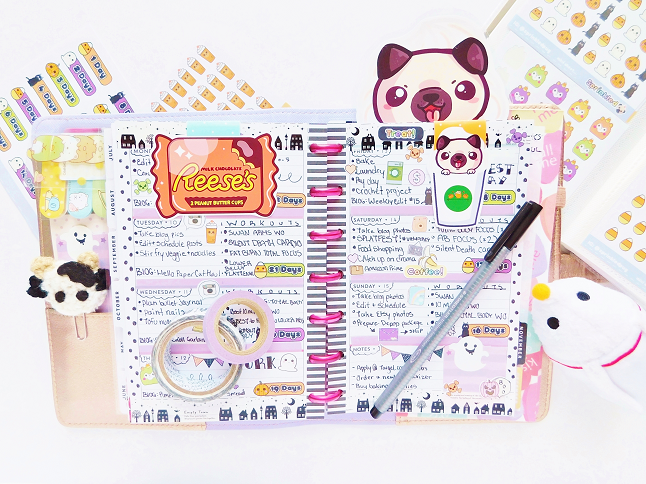 All the stickers I used are from Sprinkled Pug and most of the accessories are from HelloPaperCat. 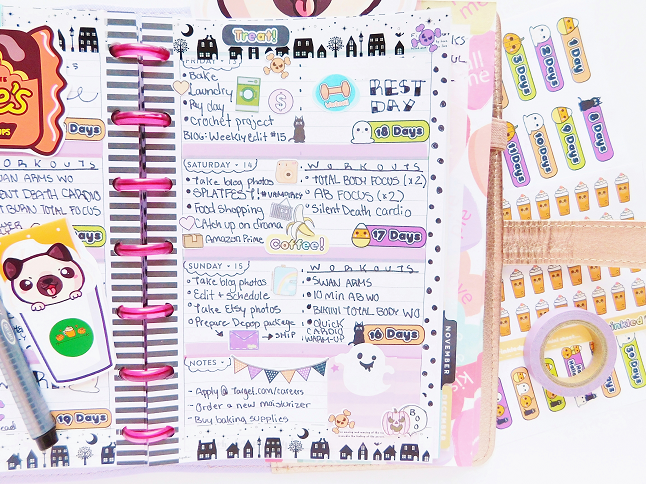 The pastel purple washi is from Micheal's and the Empty Town washi is from TinyBees. The pen I used is a Staedtler Triplus Fineliner 0.3 mm Black Pen. 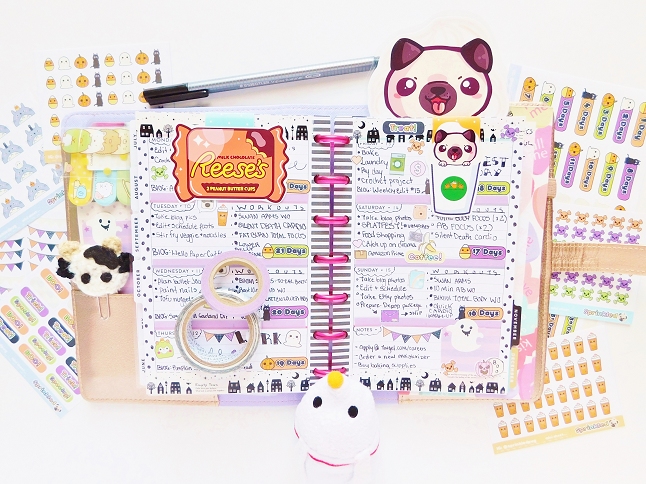 The planner I am using is a mini Happy Planner.